I have just taken up pipe smoking a matter of a month ago I have moved over from cigarette smoking and completely ditched my ciggies all ready, I am smoking around 5-7 bowls a day and loving it. 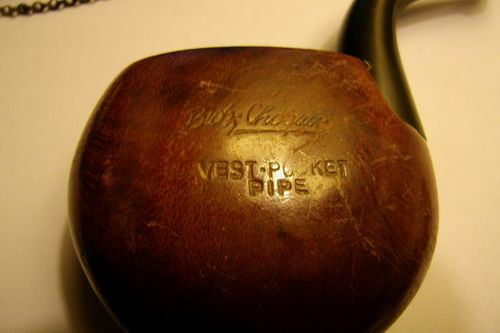 I have just purchased a lot of 4 estate pipes to try my hand and the restoration process since I have been reading that if I am smoking this much i need to rotate my pipes ( I currently have one cheap basket pipe Aldo Velani??. 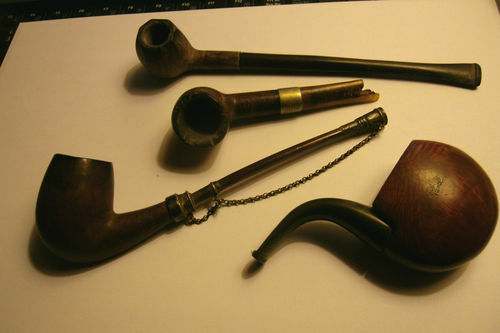 I have just won an auction for a Butz Choquin origine, a Butz Choquin vest pipe and two nondescript pipes one churchwarden type paneled bowl and one with a broken stem (photos attahced)I only paid 10euros so I'm happy with the lot! They have yet to arrive but will be here soon i hope. I'd also be happy to be told if I've been had and maybe paid to much for these, or i'm biting of more than i can chew with this project???? What is the best procedure to replace the stem on the broken pipe I am assuming this can not be repaired? If replacement is the option which i am sure it is where do i go about purchasing new stems in europe and what measurements do i need to be looking at? mortise diameter? I have a feeling that the Butz Choquin Metz origine is albatross bone, so how do i go about confirming this and subsequently cleaning it? As a side question non related i am currently in Spain where the sale of tobacco is illegal online so no Spanish tobacconist will sell online, does any body know of any good suppliers that will ship here or any good shops I can visit maybe? Thank you for taking the time to read my post, I sincerely appreciate any input anyone has please don't hold back if I've been had just let me know :-). 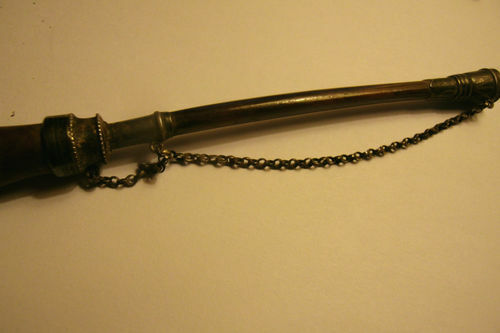 Welcome to the forums, to pipe smoking, and to the world of pipe refurbishing and restoration! Congrats on your recent purchase, and your gumption with regards to getting into cleaning up estate pipes. I've found this part of the hobby to be a great way to build up a rotation of quality briar. I think you did well for 10 euros. As far as I can tell just from the pictures you attached above, they appear to be eminently cleanable. You're right, that stem is problematic. If I were in your shoes, I would be sending it to a reputable repair shop to have a new stem (acrylic in similar colour? vulcanite? your choice) cut and fitted. If you're following blogs like this: http://rebornpipes.wordpress.com/ Watching youtube videos on restoration, and reading through the pipe repair threads here, you should have a pretty good idea of the what and how of cleaning up estate pipes. Do keep us posted with your progress! PS - Forum sponsor 4Noggins.com ships all around the world, and has a handy postage calculator on their ordering site to help you figure out what postage you'll pay for your tobacco order. Hello @pruss thanks for the speedy response!!! Glad to hear i wasn't duped on my first estate purchase, I was wondering if there was a supplier of stems rather than having to send a pipe to a repair shop? Also do you have any ideas on the choquin origene and how to tell/clean the albatross leg if it turns out this is what it is? Also what is a good rotation for the amount I'm smoking? thanks for the heads up on the 4noggins I'm checking now, any recomendations? The trouble with buying a pipe stem is fit. They are far from universal and even the same model of pipe from the same manufacturer will not necessarily have an interchangeable stem, each pipe is unique. If you are confident that you can sand and, if necessary, cut a stem to fit your stummel then that's fine. But even the most experienced amateur restorers find this troublesome. Not trying to put you off, just giving a heads-up. I may leave it to one side for now and when i have a few more tools and experiance give it a go!! thanks for all the answers it seems like a very warm and welcoming community. Nice finds, Really good looking pipes, Restoration can be a lot of fun, just take your time and I am sure they will come out great. There is nothing like smoking a pipe you worked on, enjoy. Welcome to PM Forums, vimes! 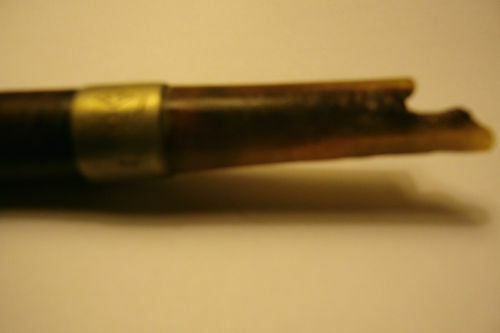 If your research online doesn't properly narrow down the "right" replacement stem(s) for your pipe(s), you can Email photos of the pipe(s) with "bad" stems to a supplier (make sure to include photos of the stummel and the stem with the bad stem removed), along with measurements (don't forget to measure the inside of the shank where the stem "fits." Even doing this, you're still taking a chance that, at worst, the stem won't fit, or that yoou will need to use files and/or sanding to "make it work." You'll also find some posts here and on other sites where an experience restorer, when the button is broken, bit through or the like, cuts off the button end of the stem and creates a new button with some patient, time consuming file work. Not to discourage you, but most folks just starting out, find replacing a stem on an estate pipe to be a challenge that's a bit much for them. In any case, good luck and please let us know how you make out! Hello @rothnh, thank you for your answer. On another note will oxyclean work for the albatross leg on the butz? Spain has some of the cheapest tobacco prices in the world. Some of the blends might be slightly cheaper in the US, with a wider choice, but add in shipping and the potential for import taxes and buying your tobacco locally wins hands down. This lists all tobacco products available in Spain and you can filter down to pipe tobacco. The search results gives the price of the tobacco, but it also includes shisha in the pipe tobacco category. In Spain there is a good selection of Peterson and Samuel Gawith tobacco available at cheap prices. Print out the list and when you find something you like, take it to your local Estanco and ask him to order some in for you. There's a ton of threads here on PM Forums and elsewhere on cleaning stems. Finally my pipes are here!! I have de oxidized my stems and restored a crack feeling confident all in all, I have just one question I am having a very hard time polishing the wood so it really shines I've been reading that white diamond or jewelers rouge then canuba wax. My problem is the remoteness of my situation here I can't find anything like that... Is there anything I can put together from common household objects/products.... also the higest grit sandpaper I can buy in the hardware store is 800. I will post picture as soon as i'm finished!! Most auto parts stores carry 1000-1500-2000 and now 3000 grit wet papers (3M brand usually) in their autobody sections. Of course any autobody supply shop would also have those grades. I've also had great results with auto plastic polish, for headlight housings, etc. Meguiars, Blue Magic, etc. all make some kind of plastic polish, which is a really a super fine polishing compound. just found a great article on buffing and polishing compound hope it helps someone else as welllink. Here I followed every tutorial on the internet I could find I used the salt method to remove any ghosts from the bowl after reaming. I uses oxyclean on the stem then cleaned the gunk out with alchol and pipe cleaners. 2) placed the stem from the other pipe into the mortise after sanding the tenon down. 5) I finished with a touch of beeswax and viola! this combined the broken stem pipe and the churchwarden ( which has a broken bowl) and gave me a a fully functional pipe!! 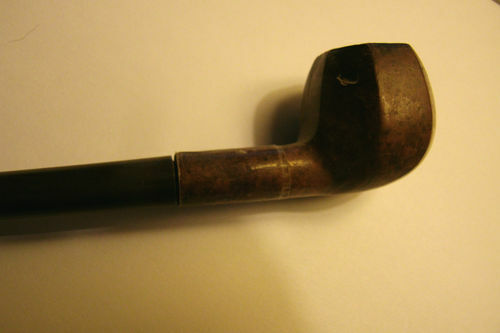 This is my first estate pipe restoration so please go easy but comments are more than welcome. ok after looking back at this again there are quite a few little things i need to do on this sand the stem - shank join so it's smother. and remove the nick on the bottom I might just redo it all again tomorrow! !